The Naval Air Warfare Center Aircraft Division and The Patuxent Partnership will host the seventh Science, Technology, Engineering, and Mathematics – Inspiring the Next Generation event on Saturday, April 27, 2019, on the St. Mary’s College of Maryland campus in St. Mary’s City. The one-day STEM-ING event is designed for middle school girls in the tri-county region to gain exposure to the STEM fields and associated careers. Throughout the day, 150 young ladies will hear from positive role models in the STEM industry and academia and will have an opportunity to select from up to 15 fun, interactive, and challenging STEM-related workshops. 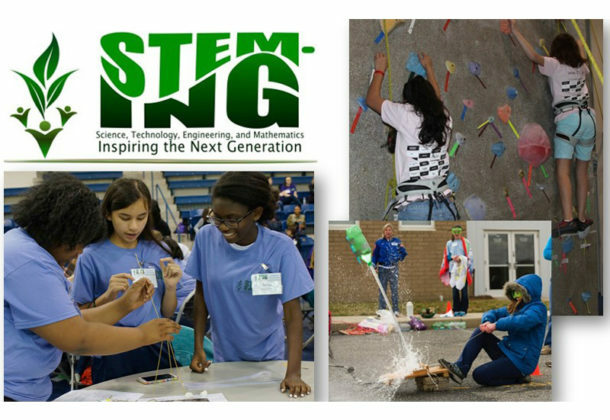 On behalf of STEM-ING, TPP is soliciting STEM workshop ideas to support this great event. Workshops, each 50 minutes in duration, should be fun, interactive, and educational. They should also help middle school girls to learn about a particular STEM topic. There have been many popular workshops over the past few years. One example was the “3…2…1…Blast Off!” workshop where students were asked to build rockets using nothing but straws, cardboard fins and modeling clay. Another was “C.S.I: Cyber Unit” where students practiced forensic case detective work to learn about cyber technology and cyber-crime investigation. “Climbing Up on Science” taught how physics keeps you safe while students were high off the ground in the sport of rock climbing. If you have any workshop-specific questions or would like to submit a workshop proposal, contact Laura Ross at laura.e.ross@navy.mil or 301-757-8986 or Kristen Finnegan at Kristen.finnegan@navy.mil or 301-342-3071. Workshop proposals should be submitted no later than 5 pm Friday, Dec. 7. If you would like to volunteer to help put on the event, contact STEMINGSOMD@gmail.com.